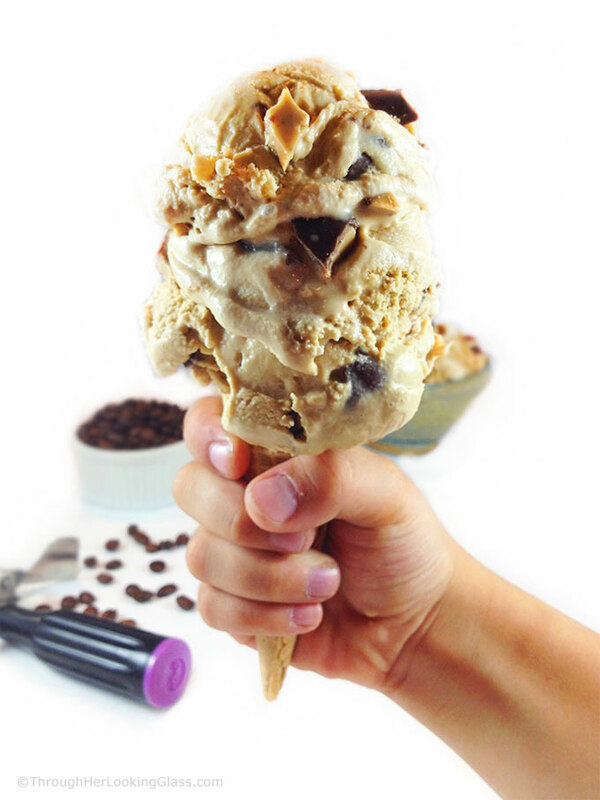 Ben & Jerry’s Coffee Heath Ice Cream: creamy, strong coffee ice cream studded with crunchy chunks of Heath toffee bar. Big treat if you’re a coffee lover like me! This Rhode Island born girl has always had a fascination for all things coffee. I was recently telling a friend about Autocrat coffee syrup from Lincoln, RI . He’d never even heard of Autocrat coffee syrup. Yep. Coffee syrup is definitely a Rhode Island thang. And in Rhode Island, we actually grew up drinking coffee milk instead of chocolate milk. Go figure. You should give it a whirl sometime. So the first time I tried Ben & Jerry’s Coffee Heath Ice Cream I thought I’d died and gone to heaven. 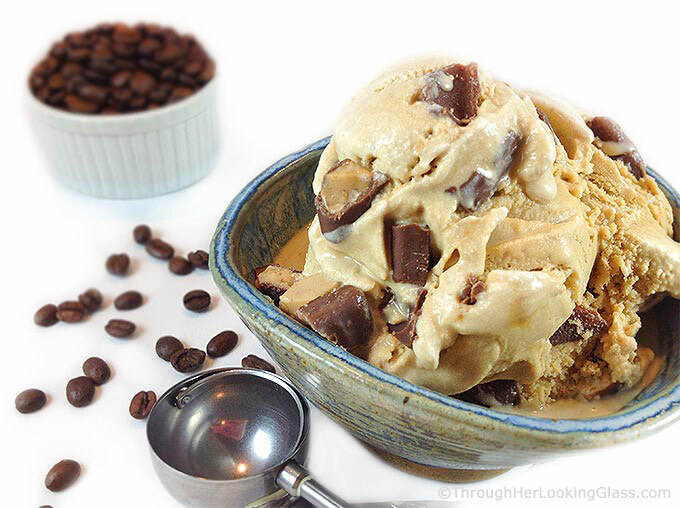 Creamy, strong coffee ice cream studded with crunchy Heath Bar chunks. Definitely a match made in heaven. “Since Ben had been experimenting with candy and ice cream combinations from the age of five, I was not surprised when he suggested we try an ice cream with Heath Bars. The concept was good – it was the execution that challenged us. We started buying individual bars, and it became my job to cut them, two at a time, into thirds. I chopped away on a plastic cutting board, using a grid as my guideline. As the demand for the flavor grew, we began buying the bars in twenty pound boxes. At first, I continued to cut each one by hand, the old fashioned way. 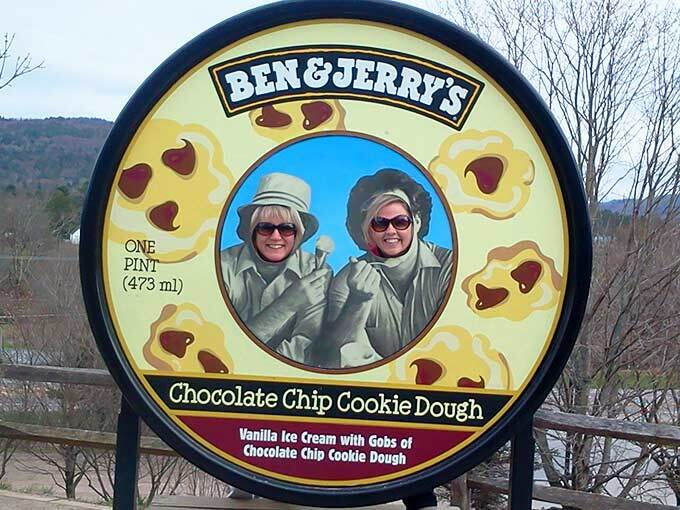 We always enjoy visiting the Ben & Jerry’s Factory in Waterbury, Vermont. This is my friend Tracy and me impersonating Ben & Jerry. Who’s Ben and who’s Jerry? I don’t know, I’m just bummed she got the waffle cone! Sure hope you enjoy this ice cream and have fun making it too! Using a sharp knife, cut the candy bars into 1/2 to 1 inch chunks. This should give you about two cups. 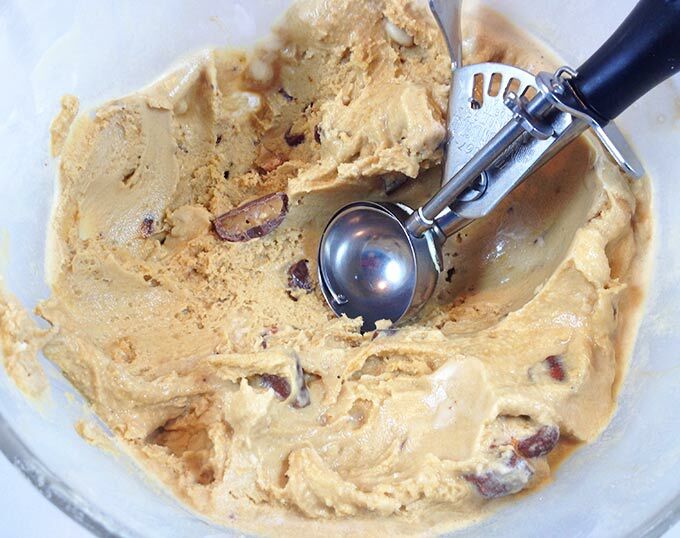 Place the Heath Bar chunks in a bowl, cover and freeze. Separately, whisk the eggs in a mixing bowl until light and fluffy, 1-2 minutes. Whisk in the sugar a little at a time. Continue whisking until completely blended, about a minute more. Add the cream, milk, and 4 tablespoons of the coffee and whisk until just blended. Optional: Chill ice cream mixture in the refrigerator until very cold, several hours. After the ice cream stiffens (about 2 minutes before it's done), add the candy and remaining 2 tablespoons coffee. Here are directions if you can't get pasteurized eggs and are concerned about consuming raw eggs. Mix cream and milk together in a saucepan and heat over medium-low heat. Meanwhile, separately, whisk eggs in medium mixing bowl ’til light and fluffy. Slowly whisk the sugar into the egg mixture, a little at a time until it’s thoroughly combined, then 1-2 minutes more. When the cream/milk mixture reaches 140°, remove from heat. Very slowly add in about 1/3 of the hot cream/milk mixture to the egg/sugar mixture, whisking quickly the whole time ’til blended. (This “tempers” the eggs so they don’t scramble when added.) Once thoroughly blended, add in the remaining cream/milk mixture. Return custard to sauce pan and heat on medium low heat until the mixture reaches 175°. (This kills off any harmful bacteria.) Chill throughly until mixture is a minimum of 40°. (You want it very cold so it freezes well in the ice cream maker.) Freeze in ice cream maker following manufacturer's directions. I wish there was a way I could reach through my screen and snag some of this! My mouth is watering. I too have never heard of coffee syrup. I guess I need to crawl out from under my rock. Yummy! These look wonderful, all my great flavors.. Wanting one right now. So cute what you did inserting your faces in the lid cover of the Ben & Jerry ice cream lid! ;) Luv what you've done here with the Heath bars in this ice cream...a version of a mud pie may be in order with this delicious creation!! omg the picture of that ice cream cone is killing me. KILLING ME!! I also never heard of Autocrat, but again. I am a simple European :) I don't like chocolate milk, so probably I am must have lived in Rhode Island in my previous life, or maybe I will in my next one. Because I like coffee milk!! This is recipe is naughty as naughty can be. But it feels so good to be bad! It is pretty naughty isn't it....Maybe you should visit Rhode Island some day. It's a beautiful state with lots of coastline and beaches. That story is hilarious! I love how cheeky Ben and Jerry are! And as a coffee fiend, I whole-heartedly approve of this recipe! Do u cook the eggs at all. I'd be worried for my kiddos if they weren't. Maybe prepare like a custard? Ohmegawsh! I've never heard of Autocrat coffee syrup - nor have I ever heard of coffee milk!!! Gosh I learned so much today - I would have so loved coffee milk when I was younger - it would have saved me from sneaking sips of my parents coffee! And as for this ice cream - Allie - it's just torturous to visit your blog with a measly granola bar or yogurt in hand! I wish I had ice cream for breakfast instead - it has eggs in it after all right?! Allie, love this story about a quick and easy way to achieve the necessary size pieces of his delicious ice cream. Also enjoy the fact that the simplest experiences turn out to be the material for entertaining stories. Picture of you and Tracy is adorable. I love that you can see the humor and the goodness in even the smallest of situations. Love the stories and recipes. Please keep them coming. Love and prayers to all. Have I told you my story on this???? So when I went through my "troubles" 3 years ago and lost 30 pounds I discovered B&J Coffee Heath Bar Crunch and I ate a pint 5 days a week! It basically was the only food I ate. My diet started to return and I continued to eat about 2-3 pints a week and then the worst of the worst happened - they took out the Heath Bars!!!! And they put a generic toffee bar in there and I couldn't stand the taste of it anymore. I have since changed over to Friendly's Vienna Mocha Chip - which is a great substitute. But I am going to try this recipe FOR SURE!!!!!! I've NOT heard this story Mike, or of the "troubles". Very sorry to hear of them. And also the switch out of the Heath Bars. What a crock. That's because Ben & Jerry aren't at the helm anymore. The would never have put up with that. We should start a petition or something. (Or just make our own Heath ice-cream .) Will have to try the Vienna Mocha Chip at our house....wish I could eat a pint 5 days a week. But I wouldn't fit in my jeans, maybe even my house. This is the second time Heath Bars have come up un conversation this week and I've still never had one. I don't think they have them in Canada! This ice cream looks and sounds delicious. Love coffee flavoured almost anything! Oh yes, you absolutely must try a Heath bar! My boyfriend is a true ice cream lover/devotee, but I've yet to make him ice cream. I'll have to give this a try one day! Oh yes, then you must make this for him Dani. It's a very easy recipe and he will love it! You had me at Ben & Jerry's. I love their ice cream!! I need to try this. Like YESTERDAY! This looks insanely good and I want to eat it through the screen. I would LOVE to go to the Ben and Jerry's factory, but I think I would come out about 100lbs heavier haha. This sounds like my kind of ice cream! All my favorite flavors! Ok, Allie! At the rate you're putting up delicious recipes for summer desserts, I'm going to gain back the 20 pounds I lost last year! Kevin can't resist trying this new ice cream flavor! 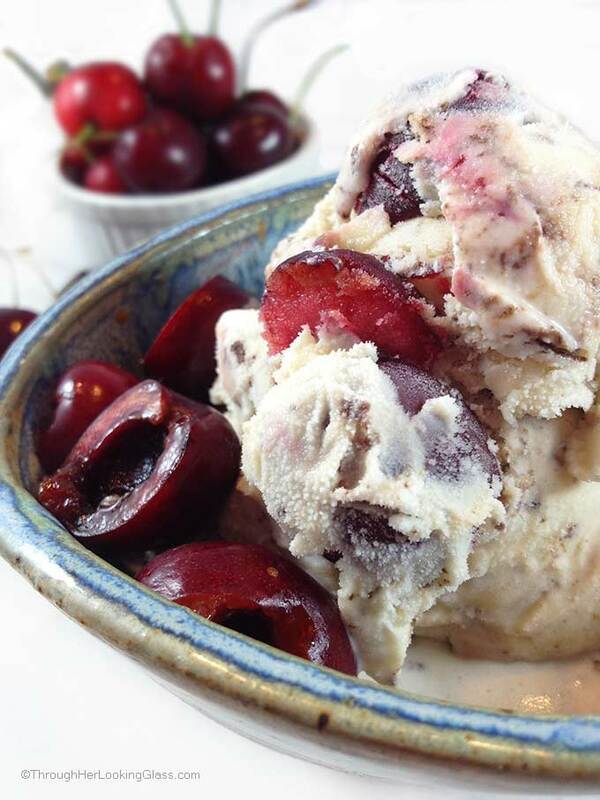 Especially since the Chocolate Cherry Garcia is so delicious, we've made it twice! Ice cream, chocolate, coffee...all my weaknesses!!! I already know I would love this! NOM times 1 MILLION!!!!!! I WISH WISH WISH I COULD eat this! Oh man do I ever! OMG! This sounds fantastic! i actually do not like coffee to drink…but as a flavor, like in this ice cream, I'm all over it! I am so glad I found this piece! Things have been crazy this month so I have missed some. I was catching up. Glad I saw this. Number one, this is one of my favorite flavors too. Number two, my husband loves coffe milk so I must buy some of that coffee syrup. Thank you for the brand name:) Number three I am in the piece! Ha! I love this picture of us and never noticed that I had the waffle cone. Thank you again for a wonderful recipe ? BEN & JERRY’S COFFEE ICE CREAM? Yes please! :) Chocolate and coffee in an ice cream, what else could I ask for. Sounds like my kind of treat and I want this for my lunch today. May I? :) Love the idea of making this at home. Sounds like a great idea Anu - this for LUNCH!!! 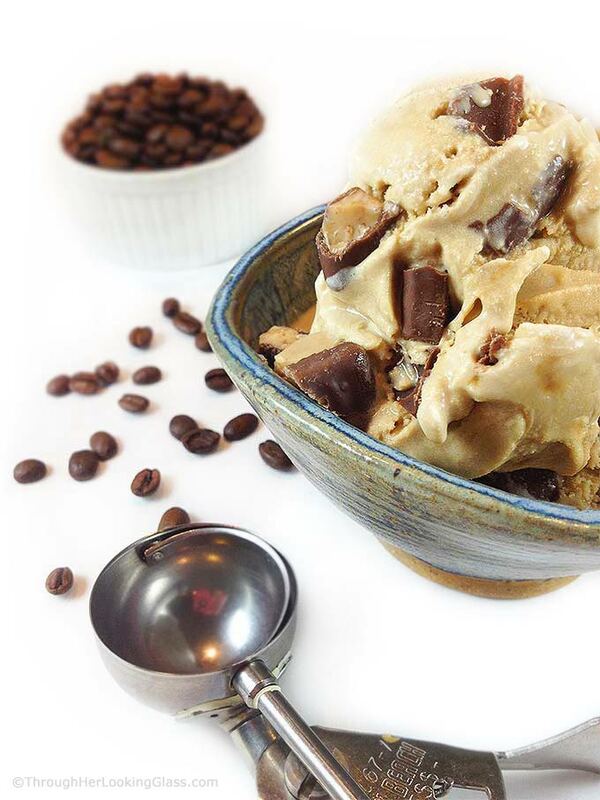 Looks absolutely fabulous!What could be a better combination than coffee and Heath bars! Mmmmmmm we just ( fairly) recently went down to Vermont and went there... Now I am partially regretting what I chose then? ?this sounds AMAZING! And I would love to try it!! I hope we can enjoy this ice cream together someday, Molly! My fiancé just bought me a Kitchen Aide mixer for Christmas as well as the ice cream making attachment! The first recipe I looked up was Coffee Heath Bar. It is my all time favorite ice cream flavor and I've wanted to make my own ever since Ben & Jerry's changed their recipe (It's just not the same anymore!!). This is so close to their original recipe! I added a caramel swirl to mine too...because why not? Thanks so much for the recipe! How awesome Brittany. Your fiancé is obviously a keeper. Yay on the Kitchen Aid and the caramel swirl. Yep, I agree - their Coffee Heath Bar is not the same. Glad we can still have it anyway. Thanks so much for dropping by!